We’ve updated the WebRank SEO Extension for our Safari users as well. There are several new additions including Website security check, new widescreen layout for scroll free viewing, server location, and Sociometer with Facebook Likes, Tweets and Google Plus. For our new users, the extension shows Google Pagerank, Alexa, Compete and Quantcast Rank alongwith information about number of websites linking back to yours. 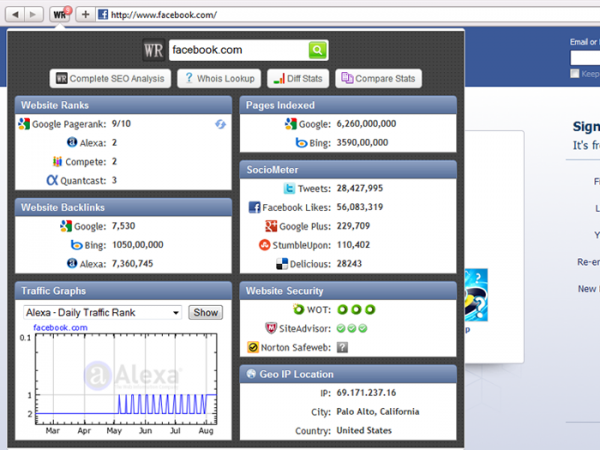 You can also check traffic graphs as well as pages indexed in Google and Bing. You can get all this information without ever leaving the webpage you are on with PageRank information right on the extension icon. You can always visit webrankstats.com for more in-depth analysis. This entry was posted in Extensions and tagged extension, safari extension, seo, seo extension, seo safari, traffic graphs, webrank safari, webrank seo, website security by WebRankStats. Bookmark the permalink.